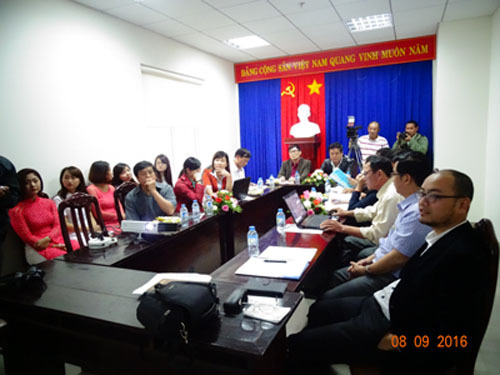 With agreement of UN-REDD+ Vietnam phase II leader, on September 8th 2016, at Lam Dong Administration Center, UN-REDD+ Lam Dong PPMU celebrated “REDD+ action plan (RIA) with BDS integration implementation agreement signing ceremony” with Nam Ban FMB, Lan Tranh FMB from Lam Ha district and Tan Thuong FMB from Di Linh district. RIAs of 3 forest owners were signed as the results of hard work of these 3 forest owners, PPMU Lam Dong with the support of PMU’s relevant units during 7 months (March 2016 – September 2016). The ceremony had the attendance of representatives from PMU, Lam Dong PPMU, DARD of Lam Dong, 3 forest owners and provincial newspaper and television (total 22 persons, including 9 women took 41%). After forest owners had presented main points of their RIA and some proposed activities, 3 RIA were signed. Leaders of 3 forest owners and PPMU Lam Dong had a meeting to discuss about the plan implementation in coming time with households and household groups. At the same time, RIAs needed to be made public to units and people in Lam Ha and Di Linh districts and agreed with the RIA implementation method to ensure the approved requirement and timeline. By signing 3 new RIAs/BDS, right now Lam Dong province have already had 9 approved SiRAPs ( including 2 village level SiRAPs of Kala Tongu – Bao Thuan commune – Di Linh district and Preteing 2 – Phu Son commune – Lam ha district; SiRAP of Loc Phu commune – Bao Lam district; SiRAP of Da Nhim commune – Lac Duong district; and 5 forest owner SiRAPs of Da Huoai, Serepok, Lan Tranh, Nam Ban, Tan Thuong) in which 6 SiRAPs have been implementing with good results.